Polska wersja postu znajduje się tutaj. During these four years of my research stays in the United States (three years in the Los Angeles diocese and one year in the Galveston-Houston diocese [Rev. Prof. Rudnicki probably means here the Episcopal diocese of Texas] I served as a non-stipendiary priest in three Episcopal parishes. It was simply a need of my soul: not to stop being a priest. There were only low church parishes in the surroundings of the University where I worked, even though I would rather have served in a high church one. But I had no choice. I obtained a permission and a referral from my bishop in Plock and got a certificate from the bishop in charge of the respective Episcopal diocese. The Anglican church is doctrinally comprehensive enough for me to fit in with my Mariavtism without any problem. In March of last year he led the first Episcopal Service in Cracow together with Bishop Pierre Whalon. 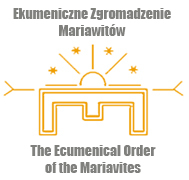 In October 2012 he started presiding at monthly Eucharists of the Polish Episcopal Network. Less than a month ago we celebrated the first anniversary of this. We have seen that he was becoming still weaker. The awareness that had accompanied us for some time that every Eucharist he celebrates, every meeting, every conversation may be the last one returned when we said goodbye at St. Martin’s. He was exhausted yet also happy that after all disappointments with the reality of Polish church life, he could take part in building something new, something hopeful. So even though we realized that he took upon himself duties exceeding his strength, we couldn’t bring ourselves to say what reason told us to… So we kept hoping that it’s not the time yet, that we will see him again. Unfortunately, this hope turned out to be futile. Yesterday morning we received the news whose meaning we haven’t fully comprehended yet, we think. 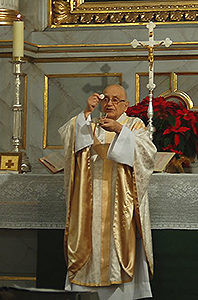 Brother Paweł is gone, and the Polish Episcopal Network is left without a priest. We believe that the Lord of life and death has welcomed our brother into his glory. But we here awfully miss him. We invite all who would like to bid farewell to the Rev. Prof. Rudnicki and express gratitude for what he has been for us and what he has done to the service on Saturday 16 at 6 pm in sw. Filipa Street 23 in Cracow. This entry was posted in English entries and tagged Konrad Rudnicki, Polish Episcopal Network. Bookmark the permalink. There are 5 Episcopal Church Dioceses in Texas; Fr. Rudnicki is attempting to differentiate this one from the others due to the fact that its name makes it sound like it covers the entire State. It does not. The one Fr. Rudnicki is referencing has its see in Houston, Texas, and is called the “Episcopal Diocese of Texas.” This diocese is situated in the southeastern quartile of Texas, including the cities of Austin, Beaumont, Galveston, Waco, and Houston. It is distinct from the Episcopal Dioceses of Dallas, Fort Worth, Northwest Texas (Lubbock), and West Texas (San Antonio).